Malcolm Cooper did not tolerate distractions. He was so single-minded and dedicated in his pursuit of shooting excellence that he and wife Sarah, a successful international shooter herself, had no children or pets and did not own a television. It worked, as Cooper became the first man to win gold medals in the three-position small bore rifle at consecutive Olympics. Nothing was left to chance. In order to improve his cardiovascular system, Cooper would swim 30 lengths of his local pool in Havant, Hampshire every morning and then go for a run. He studied Zen and Yoga to better prepare himself for the Games and much of his training took place in a rifle range built under his home in Hayling Island. At the Los Angeles Games in 1984, the competition took place in blistering heat over almost five hours at the Prado Olympic Shooting Park on the outskirts of the city. Cooper was fourth after the prone stage, but moved into the lead during the standing position phase. 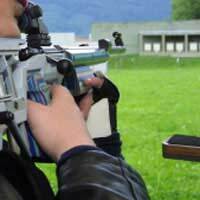 He shot 395 out of 400 in the kneeling position to score 1,173 points out of 1,200 and win by 10 points from Switzerland's Daniel Nipkow, with Cooper's fellow Briton Alister Allan taking bronze. Later, Cooper revealed that the barrel of his rifle had broken away from the stock only three days before the competition and he had spent three hours putting it back together. The gold was Britain's first in shooting since 1968, and with bronze medals for both Barry Dagger in the 10m air rifle and Michael Sullivan in the 50m rifle prone, Los Angeles provided Britain's biggest medal haul in shooting since 1924. In Seoul, Cooper trailed Allan by a point after the qualification phase, but shot 99.3 in the final to win gold with 1279.3. Scotsman Allan was second (1275.6) and Soviet Kirill Ivanov third (1275.0). A BBC television crew had almost undermined the bid for a second gold when Cooper's rifle was knocked over, but a Russian armourer was able to repair the damage. It was a successful conclusion to a long Olympic career for Cooper, who made his debut at the 1972 Games in Munich, where he was 18th in the three position event and 12th in free rifle. Cooper, dubbed Cooperman by his supporters, was again 18th in the three position event at Montreal in 1976 and, four years later, the National Small Bore Rifle Association (NSRA) supported Prime Minister Margaret Thatcher's call for a boycott of Moscow Games in protest at the Soviet invasion of Afghanistan. It deprived Cooper of an excellent opportunity for his first Olympic medal. Cooper, born in Camberley, Surrey in 1947, got serious about shooting in New Zealand, where he lived for three years during his father's foreign posting as a lieutenant in the Royal Navy. On his return to England, he trained as a shipwright's apprentice at Portsmouth. As well as his Olympic success, Cooper collected a host of national, Commonwealth, European and world titles. At the 1985 European Championships, he won all five individual events and the following year he set five world records at the World Championships to consolidate his reputation as the world's premier marksman. He teamed up with wife Sarah to win the three position pairs event at the 1986 Commonwealth Games in Edinburgh. Cooper, appointed MBE in 1984, retired from the sport in 1991 to develop his precision engineering company Accuracy International. He died from cancer in 2001, aged 53.